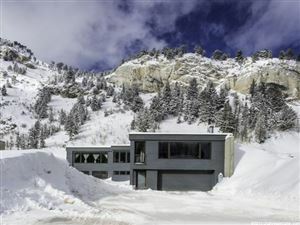 To live in Alta Utah starts with a Custom MLS Search in our Alta UT Real Estate Guide to find homes for sale, condos, houses in SLC local Real Estate area. Alta is a town in Salt Lake County, Utah, United States. It is part of the Salt Lake City, Utah Metropolitan Statistical Area. The population was 383 at the 2010 census, a slight increase from the 2000 figure of 370. Alta is also the location of Alta Ski Area, a ski resort that has 500,000 visitors a year. It is known for its powder skiing and its refusal to allow snowboarding. Alta has been important to the development of skiing in Utah. Alta was founded about 1865 to house miners from the Emma mine, the Flagstaff mine, and other silver mines in Little Cottonwood Canyon. Sensationally rich silver ore in the Emma mine enabled its owners to sell the mine at an inflated price to British investors in 1871. The subsequent exhaustion of the Emma ore body led to the recall of the American ambassador to Great Britain, who was a director of the company, and Congressional hearings in Washington. An 1878 fire and an 1885 avalanche destroyed most of the original mining town, though some mining activity persisted into the 20th century. By the 1930s, only one resident, George Watson, remained in the town. Facing back taxes on mining claims he owned, Watson donated much of the land in Alta to the U.S. Forest Service. Watson stipulated that the Forest Service use the land to construct a ski area. In 1935, Norwegian skiing legend Alf Engen was hired to help develop the area, and Alta opened its first ski lift in 1938. Today, Alta is a small town, centered around the Alta Ski Area. The search below shows listings for Single Family, Multi Family, Duplex, Townhouse, Condo, and Recreational houses with newest listings first in Alta only, new listings are updated every morning at 9:00am. Please click on the save search button below and you will receive the Alta updates daily and may unsubscribe anytime.